The forces required to actuate the cyclical motion of breathing are in large part determined by the interrelationship between the mechanical compliances of the lung and chest wall as described individually in lung compliance and chest wall compliance, respectively. Although not physically attached, the lung and chest wall are intimately apposed to one another across the intrapleural space similar in arrangement to two touching wet balloons, one within the other. Importantly, the intrapleural space acts as a sealed compartment which can maintain large variations in pressure; consequently, the forces generated by the lung and chest wall can be communicated to one another by changing the pressure within the intrapleural space. Given the capacity of the intrapleural space to communicate changes in pressure, the integrated compliance of the pulmonary system appears to model the summed compliance curves of the lung and chest wall. Above we have plotted how the volume of a lung-chest wall unit varies given changes in the transmural pressure, meaning the pressure of the alveolar air compared to atmospheric pressure. Positive pressures indicate greater alveolar pressure than atmospheric pressure. As can be seen, the generated integrated compliance curve largely can be derived from the summation of the isolated lung and chest wall compliance curves discussed in lung compliance and chest wall compliance, respectively. Below we discuss the features of the compliance curve at different lung volumes and values of transmural pressure. Recall that the Functional Residual Capacity (FRC) refers to the volume of the lung after a normal breath is expired (See: Lung Volumes). As observed from the integrated compliance curve above, the lung remains at the FRC when there is zero transmural pressure, that is, when the alveolar pressure is equivalent to the atmospheric pressure. The FRC represents the volume at which the entire lung-chest wall unit is at mechanical equilibrium. Here, the elastic recoil of the lung is perfectly balanced with the mechanical tendency of the chest wall to spring outward, resulting in no net movement of the respiratory system. Volumetric expansion above the FRC requires the application of positive transmural pressures into the lung-chest wall unit. This feature is the result of the changes in the individual compliances of the lung and chest wall. As lung volume expands above the FRC, the elastic recoil of the lung generates progressively greater recoiling forces. In contrast, as the chest wall volume expands above the FRC, the outward springing force of the chest wall declines and at very high volumes inverts to a recoiling force. Consequently, the summed forces of the lung and chest wall display progressively stronger net recoiling forces, explaining why increasingly positive transmural pressures must be applied to expand the lung-chest wall unit above the FRC. This feature also explains why expiration during normal quiet breathing can occur completely passively in the absence of muscle activity as described in breathing biomechanics. In essence, following an inspiration above FRC, the lung-chest wall unit generates a recoiling force which will spontaneously return the lung volume to the FRC once the inspiratory muscles relax. Volumetric contraction below the FRC requires the application of negative transmural pressures to the lung-chest wall unit. This features is also the result of changes in the individual compliances of the lung and chest wall. As the lung volume contracts below the FRC, the elastic recoil of the lung declines and thus generates smaller collapsing forces. As the chest wall volume contracts below the FRC, the outward springing force of the chest wall rapidly increases, generating progressively greater expanding forces. Consequently, the summed forces of the lung and chest wall display progressively stronger outward springing forces, explaining why increasingly negative transmural pressures must be applied to contract the lung-chest wall unit below the FRC. This feature also explains why forceful expiration to lung volumes lower than the FRC is followed by inspiration back to the FRC completely passively in the absence of any muscle activity. 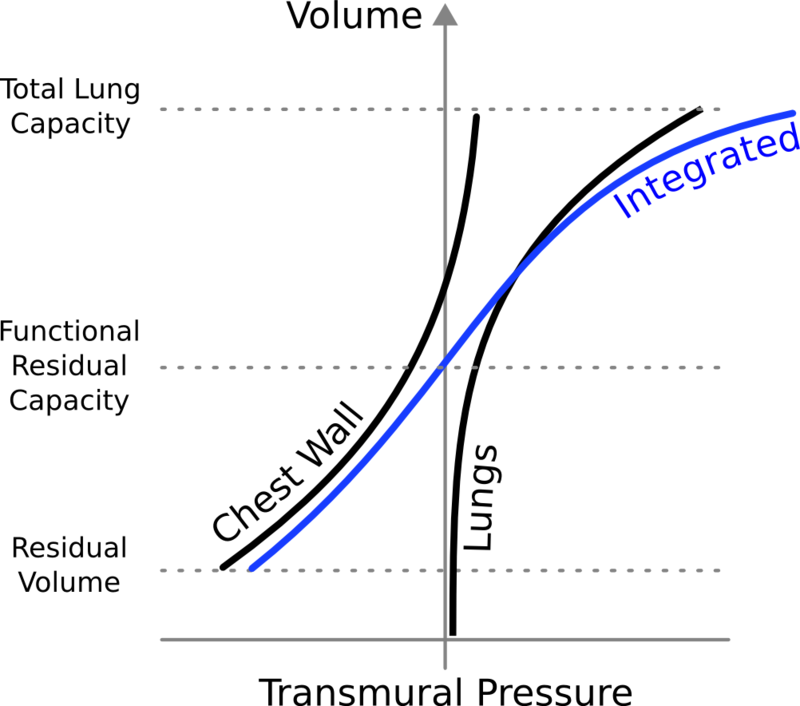 The compliance curves of the isolated chest wall and lungs are plotted in black while the integrated compliance curve of the chest wall-lung unit is shown in blue. This blue curve represents the summation of the transmural pressures of the isolated chest wall and lungs at a given volume. When these pressures are precisely equal and opposing, the chest wall-lung unit is at equilibrium and, as seen, this occurs at the Functional Residual Capacity. Expansion of the lung-chest wall unit beyond the FRC requires positive transmural pressures, meaning that left alone the unit would collapse, yielding exhalation. Contraction of the lung-chest wall unit below the FRC requires negative transmural pressures, meaning that left alone the unit would expand, yielding spontaneous inhalation. Certain pathological states can dramatically change the compliance curves of the lung and thus perturb the volume at which the lung and chest wall achieve equilibrium. Given the discussion above, it is clear that such a derangement of equilibrium will lead to predictable changes in the Functional Residual Capacity of these individuals. Emphysema is characterized by a progressive destruction of the lung's elastic tissue and thus leads to a reduction in the lung's natural recoil. This manifests as an upward shift in the lung compliance curve, meaning that larger expansions of lung volume can be achieved with similar changes in transmural pressure. Because the outward springing force of the chest wall remains unchanged, the decreased elastic recoil of the lung results in a shift of the FRC to higher volumes. In other words, higher amounts of lung stretch must be encountered before the outward springing force of the chest wall can be resisted by lung tissue recoil. Fibrotic changes in the lung associated with IPF result in stiffness of the organ and thus reduced compliance. This manifests as a downward shift in the lung compliance curve, meaning that smaller expansions of the lung volume result from similar changes in transmural pressure. Because the outward springing force of the chest wall remains unchanged, the increased stiffness of the lung results in a shift of the FRC to smaller volumes. In other words, smaller amounts of lung stretch are successfully able to overcome the outward springing force of the chest wall, resulting in a lower FRC equilibrium point for the lung-chest wall unit.